The use of tool by animals is surprisingly rare. Among birds the Egyptian Vulture uses rocks to crack Ostrich eggs, the New Caledonian Crow and Woodpecker Finch (one of several Darwin Finches of the Galapagos Islands), uses sticks to extract grubs from inside a branch. 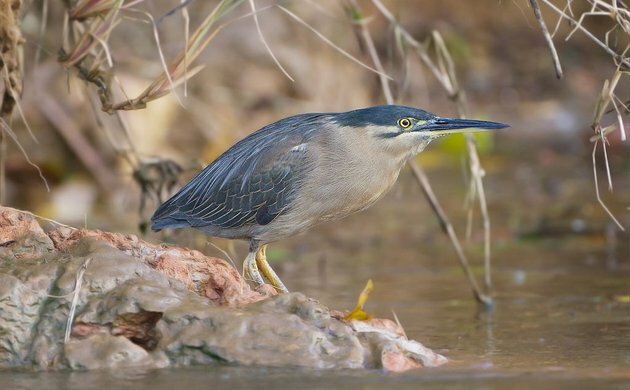 Perhaps even more interesting is how Green Herons and its relatives have learned to use bait to attract and capture fish. I find fascinating the fact that Egyptian Vultures, New Caledonian Crows and Woodpecker Finches learned to use a tool with tremendous success. As it turns out, this behavior appears to be inherent, meaning young birds do not necessarily need to see others do it and then repeat it themselves. They only need to master the technique by practicing; they are born knowing what to do. This is similar to the fact that all birds, even first time breeders within a species build identical nests. Further support for inherent behavior comes from experiments. Egyptian Vultures raised is isolation used rocks to crack eggs presented to them. The behavior was inherent. Among Woodpecker Finches, young birds quickly learn to use tools by watching how adult birds do it. But direct observation suggests that young Woodpecker Finches will learn to use a tool on their own. All they need is time to master the technique. Woodpecker Finch using a tool. Photo: Peter Wilton. But no all Darwin Finches have developed this behavior. In another experiment, other species of Darwin Finches were kept next to Woodpecker Finches that used tools. 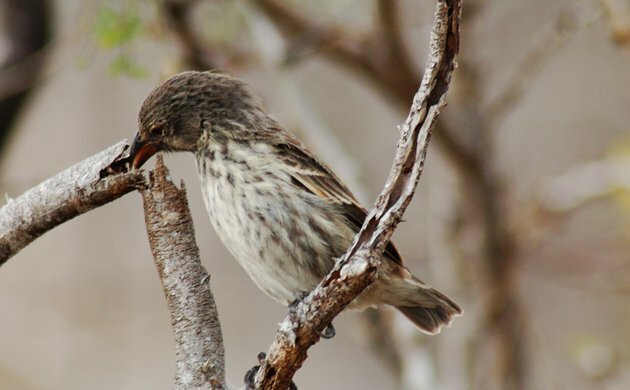 Some individuals of the other finch species learned this behavior while other did not at all, suggesting difference in the capacity to learn novel behaviors. Some individuals are somehow smarter than others. Green Herons have learned to use bait for fishing. Students of animal behavior suggest that making the connection between intentionally dropping something on the water and expect a crowd of fish around the bait and subsequent consumption is very difficult. According to these researchers, only the exceptionally intelligent herons acquire the skill of bait fishing. Indeed only a small percentage of Green and Striated Herons (both closely related) engage in bait-fishing. I believe it may not be as difficult for a Green or Striated Herons to learn this behavior. It may take just being at the right place at the right time. In general, fish will swim to investigate anything that falls on the water hoping the object might be prey. This is particularly obvious in urban ponds with lots of small fish. Interestingly some of these ponds are favored by these herons for foraging and have ducks that are fed by people. It would not take much for a herons that happens to be foraging for fish (the normal way) to notice that bread tossed at the ducks were nearly immediately crowded by hungry fish. When bread landed near a heron, this probably caught as many fish as it could given the opportunity. Then the bread-easy-catch connection was made. A Green or Striated Heron at the right place and right time needed to just keep the bread within reach and catch as many fish as the bait lasts before the bait is consumed. At least this is how it might have started. Over time, experienced herons might have expanded on this by finding bait near ponds and bringing them into the water for a more rewarding fishing experience. I would not be surprised if smarter herons carry their bait around in search of the most productive pond. As shown in the video, bait-fishing is more efficient than regular sit-and-wait fishing. Just a bit of ingenuity can make a big difference for these herons and their progeny if they are breeding. What a great post! No matter what the species, some are just smarter than others. (The scientists who have figured this out are simply smarter than their colleagues.) Love the video, especially the fishing heron interrupted by a chicken. I’ve never seen such good footage of baiting behavior. Thanks! Glad you enjoyed Suzie. I like the videos too. Particularly the first one. That heron caught a lot of fish with just a small piece of bread. Smart creatures indeed.